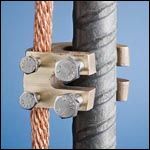 The 2005 NEC® standard requires bonding to concrete encased electrodes (rebar) in grounding systems. In some states, the Authorities Having Jurisdiction (AHJ) have taken this requirement a step further and require two connection points to the rebar. 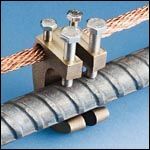 The ERITECH® RC70/RC100 rebar clamp provides two connection points to rebar in grounding systems. This heavy-duty rebar clamp features high-strength bronze alloy construction. The durable direct-burial ground clamp from ERICO® is easy to install and UL® Listed. The ERITECH RC70 handles wires up to 2/0 (70 mm²) and the RC100 handles wires up to 4/0 (100 mm²).